I can't wait until Saturday. I love Saturdays, because it is the one day a week where I get to spend the entire day and evening in my craft room! All the other days I head downstairs to the family room at 7pm to have dinner and spend the evening with my husband watching TV (usually I don't watch. I take my laptop down and this is when I usually write my blog posts). When you are an empty nester you get to spend this much time doing what you like. And when you combined the fact that I am disabled on top of that and don't work outside the home, I get to spend A LOT of time crafting or such. You would think I would be overwhelmed with all this time I have and cards would be flying out my ears, but right now I am in kind of a slump (lost my crafty mojo I think) and crafting just doesn't sound fun at times. Plus the fact that I suffer with chronic pain and a few other aliments. I push myself a lot. It really helps with the new catalog coming out and all the new product I get to play with right now. 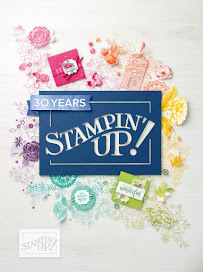 A major plus to being a Stampin' Up! demonstrator! This is my 3rd time as a demonstrator seeing a new Annual catalog launch, and I have to say that this catalog is the most absolutely amazing one yet! 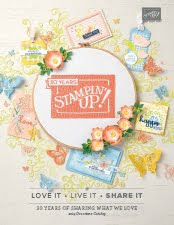 So many stamp sets now come with the option of getting Framelits or Thinlits with them making fussy cutting a thing of the past. And then all the new ribbon and DSP (Designer Series Paper) are so gorgeous. I am loving all the color combos. Speaking of new items, here is a new card I made with new products from the new Annual catalog, some of which you can get right now. More about that at the end of this post so check it out. The color pink, and it's many variations, is my most favorite color. Even though the new In Color Lemon-Lime Twist is my ultimate fave I still have a place in my heart for Powder Pink and Berry Burst. In fact, Berry Burst is the color I used for my card today. I wanted to use some of the new Color Theory DSP Stack. I love the ombre effect of the one paper and when you cut it right it reminds me very much of a paint strip you get at a hardware store. I have also been wanting to use some more of the Eastern Gold Vinyl Stickers, so I pulled them out too. I got out some cardstock and both the Eastern Beauty and Paisleys & Posies stamp sets. I started with choosing my card base, which ended up being Berry Burst at the standard A2 size, 4-1/4"x 5-1/2". I then cut a layer for the top out of Whisper White at 4"x 5-1/4". I took out my piece of Color Theory DSP and cut it to 1-1/2"x 5-1/4". I wanted it to lay down one side of the card. I really liked the look of the border Eastern Gold Vinyl Stickers so I added one to the left side and put the Color Theory DSP next to it. Next, I die cut out one of the medallions from the Eastern Medallions Framelits in Old Olive. The one I used does not cut out from the paper completely so you need to use some scissors to snip it away and out. I then die cut a piece of the Gold Foil paper with the Layering Circles in one of the scalloped circles to add a background to the medallion. I placed this onto my card with Stampin' Dimensionals. A little while back I noticed that the Paisleys & Posies stamp set had some medallion looking pieces in it that I thought would coordinate well with the Eastern Palace Suite and I was right. I used one of the stamps in Berry Burst to make the center of my focal piece. I pop dotted it up too with Dimensionals and added a Gold Faceted Gem to the center. To finish it off, I slightly turned up the corners on the Old Olive piece. This came out perfect! Next was the sentiment. 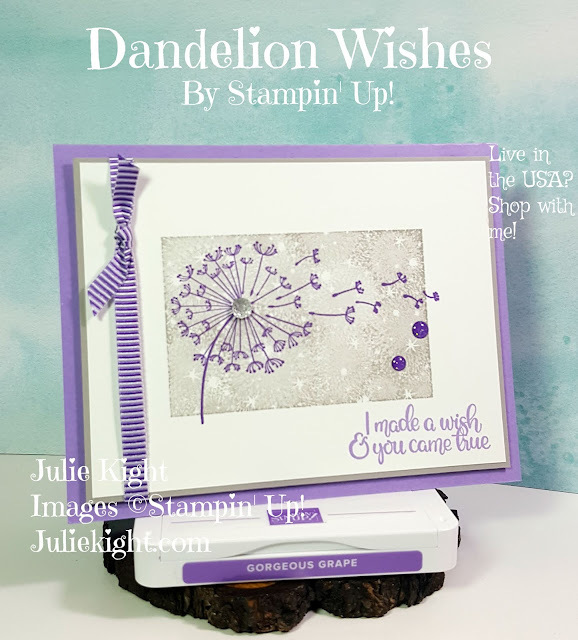 I wanted to use one of the sentiments from the Paisleys & Posies stamp set, but I did not like how long it was. 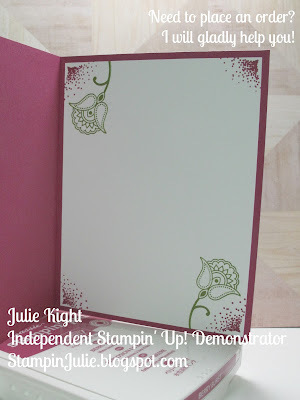 Stamp-A-Ma-Jig to the rescue! I have seen several demonstrators break their sentiments in half by stamping one half first, then stamping the other half underneath and that was exactly what I wanted to do. It would fit perfectly in the Stitched Shape Framelits oval that I wanted to use too. I had just the other day seen Brian King use the Stamp-A-Ma-Jig on a card awhile back and had remembered how he had done it, so I got mine out. I used Berry Burst again, and after a couple of mistakes and tests and trials I finally ended up with what you see on my finished card, and I love it! I backed my sentiment with a scalloped oval out of the Gold Foil, and popped it up with Dimensionals as well. This card turned out beautifully I think. Of course I can't leave the inside naked, so I used another piece of Whisper White and stamped two stamps, one from each stamp set in Berry Burst and Old Olive. Well, what do you think??? Do you like the new items you are seeing come out of the new catalog??? I sure hope so! 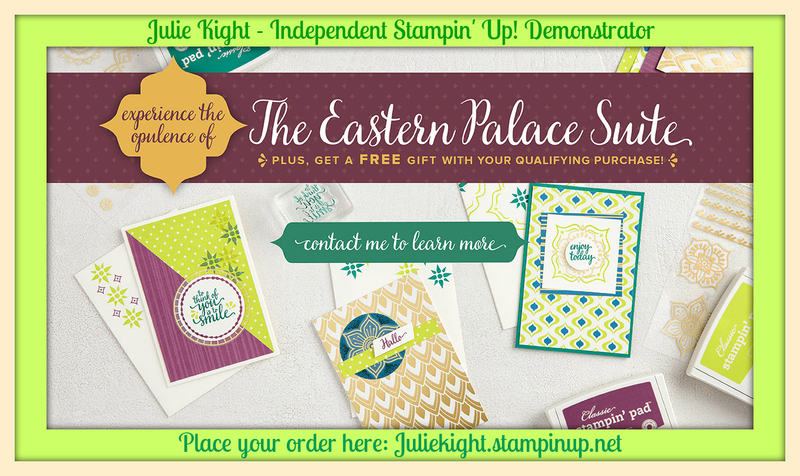 My next few blog posts until the release of the catalog on June 1st at 12pm (MDT), I am going to try using just new product so you can get great ideas about what you want. I am having a launch party and post on June 1st with a video showing what is in the new catalog. I will give you more info on that the beginning of next week. I hoping to do either a Facebook or YouTube Live, but we will see how it goes. Thanks so much for coming to my blog today and I hope your weekend gets off to a great start. I will have a new post tomorrow with my project for the Global Design Project Challenge. See you then! !